How Much Remanufactured Toners and Inks Can Save You? | TonerGreen - Eco-Friendly Toners from the U.S.
How Much Remanufactured Toners and Inks Can Save You? 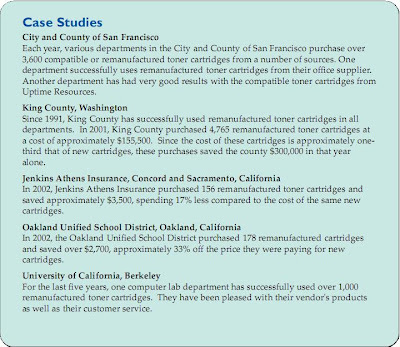 Here is an excerpt from the Alameda County Source Reduction and Recycling Board Fact Sheet (from http://www.stopwaste.org). This shows approximately how much these organizations were able to save when they started using remanufactured toners and inks.